“For anyone interested in the vibrancy of Hindu culture, this is a kind of epicenter of religious life,” said Harvard Professor Diana Eck (not pictured). Eck was joined by Harvard Divinity School students at Kumbh Mela, a six-week-long, millions-strong celebration of Mother Ganga. This is the third in a series of articles about Harvard’s interdisciplinary work at the Kumbh Mela, a religious gathering that every 12 years creates the world’s largest pop-up city. ALLAHABAD, India — Standing at the shores of the Sangam — the calm expanse of gray-blue water where the Ganges, the Yamuna, and the mythical Saraswati rivers meet — it’s not hard to sense the profound spiritual significance the spot holds for millions of Hindu pilgrims. Crossing it, however, can be a harrowing experience. It was good advice. As a third man pushed the boat off from shore, it immediately collided with a scrum of other identical boats, narrowly avoiding banging its passengers’ heads or pinching their fingers. A mix of undergraduates, doctoral candidates, and Harvard Divinity School (HDS) students, the group had been at the Kumbh Mela, Allahabad’s massive religious gathering, for several days already, and had been studying elements of the festival under Eck’s guidance for months. But there was always another jolt in store. Where better for them to learn firsthand the powerful role that nature and religion play in Indian culture than at a six-week-long, millions-strong celebration of Mother Ganga? “For anyone interested in the vibrancy of Hindu culture, this is a kind of epicenter of religious life,” Eck said. On this afternoon, the group was headed to a stretch of beach at the Sangam to track down Swami Chidanand Saraswati, a small, energetic man in saffron-colored robes cropped above the knee, with a wild puff of wiry hair and an equally untamable beard. Known simply as Swamiji to his followers, the Swami is one of the leading faces of the “Green Kumbh” movement, a new feature at this year’s Maha Kumbh Mela and an offshoot of a broader push for environmentally conscious pilgrimage in India. Indian Hindus’ relationship to their land is unique, as Eck has described in her books, most recently last year’s “India: A Sacred Geography.” In Hinduism, nature is suffused with the presence of the gods; rivers in particular have special meaning. And yet, paradoxically, Hindus’ mass devotions can overwhelm the fragile ecosystem of a river such as the Ganges, putting it in danger. “There are these dilemmas: Do we use the river water to generate hydroelectric energy? Do we use the flowing rivers to create canals and irrigation systems?” Eck said. “How does all of that relate to the sacredness of the waters, of the rivers, and the ways in which they are used by millions upon millions of people? Once Eck’s students arrived at the Kumbh, those environmental concerns became central to their work. Each had developed a project to pursue when taking the interdisciplinary course with Eck and Rahul Mehrotra, a Graduate School of Design (GSD) professor, in the fall. Their areas of interest ranged from the nature of performance and entertainment at the festival to toilets and sanitation efforts to attitudes toward the damming of the Ganga, as the Ganges is called. Rachel Taylor, a sophomore anthropology concentrator, was interested in something a little more humble: flowers. Strands of marigolds — adorning naked holy men (nagababas) like robes, strung between tents, sent down the river as an offering to Mother Ganga — are so ubiquitous at the Kumbh that after a while they hardly register. “But flowers, too, are spectacles,” Taylor wrote in her final paper for the course. They also have a charged political history. Some Hindus believe that the flowers represent luxury; the Indian political leader Mahatma Gandhi, she learned, declined to wear garlands on the principle that cutting a flower amounted to an act of violence. But other sects promoted the offering of flowers to the gods as a great equalizer, an idea that intrigued Taylor. After all, the Kumbh is also a place where caste and status are leveled, as rich and poor, men and women, all bathe together in the Ganga. At the festival, Taylor planned to learn more about what she called “the Kumbh’s most active participant.” Luckily for her, Swamiji and his followers — quickly spotted once the Harvard group landed — were focused on the marigolds, too. 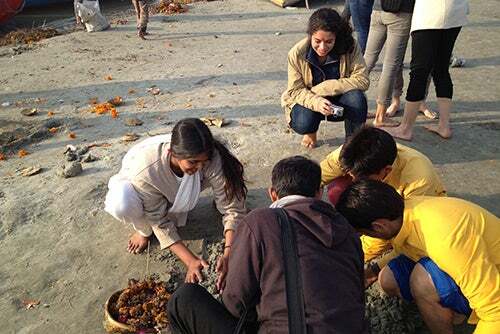 The group was staging a “symbolic action,” picking up trash and shards of clay pots (a common offering to the Ganga). They were also raking and burying large piles of soggy marigolds that would otherwise clog the river. “One of the goals is to convince pilgrims that they’re actually polluting the Ganga — they’re not worshiping her by giving her flowers,” Taylor said, as she observed Swamiji’s helpers digging holes in the sand and helped to collect trash. “It’s not that trash is for someone else,” the Swami expounded to the group. “Trash is everywhere,” and is everyone’s responsibility. But despite the flurry of media attention that the cleanup garnered, the Green Kumbh’s larger goal of a healthy Ganga is still far from a reality. Last year, the New York Times reported, India announced a multibillion-dollar effort to clean up the Ganges river basin, where water-borne illness costs its 400 million residents nearly $4 billion a year. Religious practices like those at the Kumbh, by one estimate, are responsible for 5 percent of the river’s pollution. After breaking free of the cameras, the Harvard group piled back into a boat. Students took turns snapping photos of each other in seemingly endless configurations, the waters of the Ganga gently lapping at their backs. Austin, Eck’s wife and a lecturer on psychology — as well as a skilled rower — took a turn with the oar, to cheers of “Go Dorothy!” Other boats, packed with men happily singing in Hindi, drifted past, sometimes colliding in floating traffic jams. Taylor stared quietly out the back window as the car jostled alongside the Ganga. In the evening glow of the streetlights, the clumps of wet marigolds all along the water’s edge made a textured carpet. A year before, she said, she had entered Harvard with pre-med aspirations; she was now more assured than ever of her decision to pursue anthropology. "The House I Live In" writer-director Eugene Jarecki (left) took care in the film, and during the Q-and-A, to describe the issue of the war on drugs not as one of race, but class. Jarecki was joined by Professor Charles J. Ogletree during the post-viewing discussion.